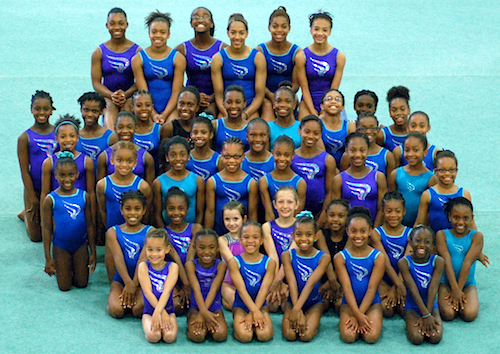 The Sportsplex USAG Girls Gymnastics Team was established in the Fall of 2004. Since its inception, the team has made a name for itself. Winning State meets at every level, gymnasts have been on the state team and have competed at the regional level. The USAG girls current competitive teams are levels 3 through 10. Our team consists of compulsory, optional and XCEL gymnasts. USA Gymnastics (USAG) has established 10 levels of gymnastics, 1 being the lowest and 10 being the highest. Gymnastics levels 1-5 are known as compulsory levels. Compulsory gymnastics is where each gymnast competes the same routine on all events and has the same gymnastics floor music. Compulsory gymnastics is set up to have a steady progression of skills that start out from the basics and build until a gymnast reaches level 6. Levels 6-10 are referred to as optional gymnastics levels. In optional gymnastics there are a set of guidelines, or level requirements and routines are built around them. Each gymnast has her own music (on the Floor Exercise) and her routine is built to show off her strengths. Scores are based on how well a gymnast performs the skills in the routine, whether she has all the requirements and whether the overall routine is enjoyable to watch. Check out each of our talented women's team levels by visiting the individual levels from the top menu bar.